This is how a molluscum lesion appears under microscopic examination. 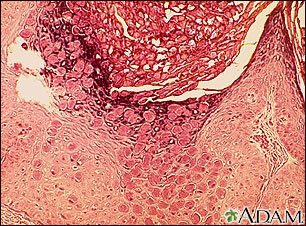 Molluscum are small, raised, pearly skin lesions caused by the molluscum virus, a member of the poxvirus family. Updated by: David L. Swanson, MD, Vice Chair of Medical Dermatology, Associate Professor of Dermatology, Mayo Medical School, Scottsdale, AZ. Also reviewed by David Zieve, MD, MHA, Medical Director, Brenda Conaway, Editorial Director, and the A.D.A.M. Editorial team.